The Tree House Lodge is a 10-acre oceanfront ecolodge to the south of Puerto Viejo on Costa Rica’s Caribbean coast. We’ve created an ideal blend of imaginative ecological buildings, complete with a Tree House, and natural scenery for you to enjoy. All nestled in Playa Chiquita on the edge of the Gandoca-Manzanillo wildlife refuge. Featuring just six open-air houses hidden away in the nature, steps from the white sands of Punta Uva beach. 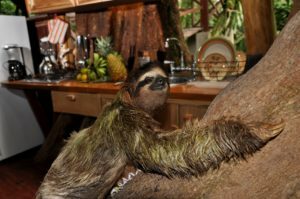 You’ll enjoy all the luxuries of an ecolodge with a friendly personalized touch. The Tree House Lodge is perfect for couples and families who wish to stay in a real Costa Rican authentic experiences and are looking for an off the beaten path destination that offers more than the typical luxury hotel experience alone. …we are part of nature. Built entirely from fallen Nispero (loquat) trees that oxen dragged from deep in the rainforest, the Beach House lies 80m from the shoreline, so you can actually lie in bed and watch waves lap the beach. 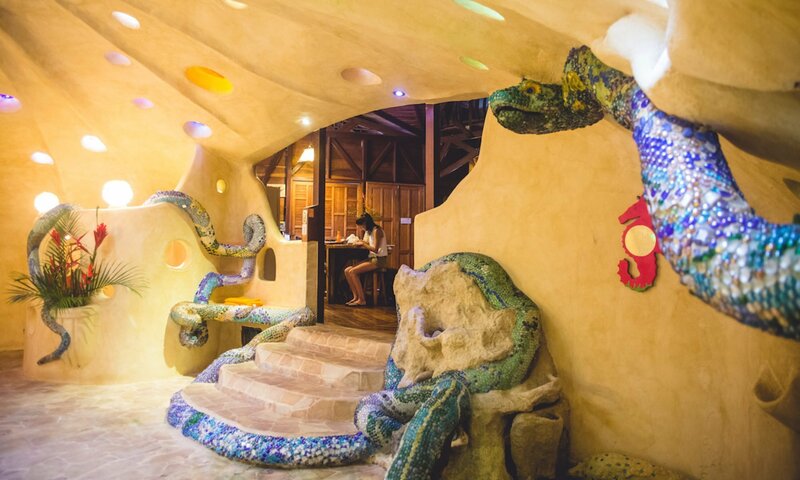 This house is a magical fantasy surrounded by recycled art and nature incorporated. The House has two bedrooms and sleeps up to 6 people. Built on tall stilts, this back-to-your-childhood house is submerged by the forest, with a sloped wooden suspension bridge leading steeply to its front door. The latest addition to Tree House Lodge’s collection of imaginative houses, The School Bus, is an up-cycled 1980-era bus re-purposed into a visually stimulating creative space nestled in lush garden, at once inspiring and relaxing. While staying at our beautiful Tree Houses, you’ll find many activities and things to do. Our weddings and wedding receptions create wonderful memories you and your guests will remember forever.